The residential construction industry will see out another healthy year in 2015/16, says the Housing Industry Association (HIA). 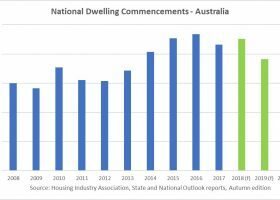 “New dwelling commencements will remain at very elevated levels in 2015/16 while the pace of recovery in renovations activity will accelerate,” said HIA Chief Economist, Dr Harley Dale. “It is from 2016/17 onwards that the industry risks a relatively sharp decline from record levels, highlighting the timeliness of renewing a focus on meaningful housing policy reforms,” said Harley Dale. A strong pipeline of approved activity will sustain a historically high level of new dwelling commencements throughout 2015/16. This will be a very good result not only for the new home building sector but for the broader economy. Approvals have been outpacing commencements for much of the current cycle. This has resulted in a sizable backlog of dwellings that have been approved but have not yet commenced construction. This backlog totalled over 35,000 at the end of June. Most of the backlog is located in New South Wales where there are over 17,000 approved dwellings awaiting commencement, comprised of 3,365 detached dwellings and 13,930 multi- units. NSW accounts for half of all dwellings approved but not yet commenced nationally. Beyond 2015/16 the contraction in detached dwelling commencements is forecast to be moderate when compared with the multi-unit segment. Australia’s renovations market saw considerable decline between 2011 and 2013 involving a reduction of almost 30 per cent, but a subsequent modest recovery is forecast to continue. The recovery in renovations activity will be helped by the ageing of the dwelling stock across Australia over the rest of the decade. This is the result of relatively high levels of house building during the late 1990s and early 2000s.